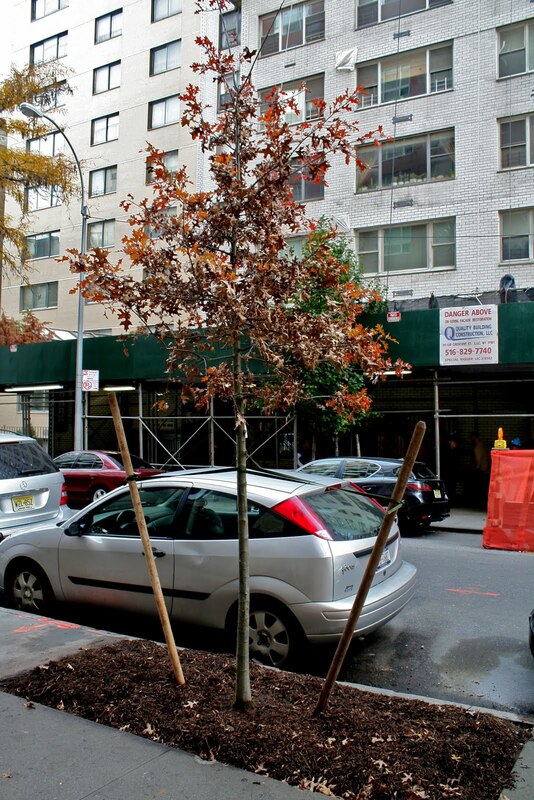 New York City has a program to plant a million new trees within its five borough's. I wonder what number I got. 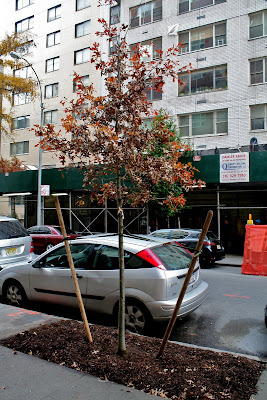 The pin oak, one of the four in tree pits in front of my building, 'died' in 2009. I called the Dept. of Parks and Recreation in the fall, got a case number and a place on the waiting list. The tree was cut down 5/25/10, and two months later, sprouted shoots from the 'dead' stump, so not dead, but not a tree either. The city plants trees only in spring and fall. No action fall of '09, spring or fall of '10, or spring '11. Finally, Nov. 15, 2011 the contractor hired by the city dug up the stump, enlarged the tree pit and planted, amazingly, what I had requested, another pin oak. With new soil, several inches of dark mulch, and without a fence or curb, in one day it became the favorite peeing place of all dogs on the Upper East Side. 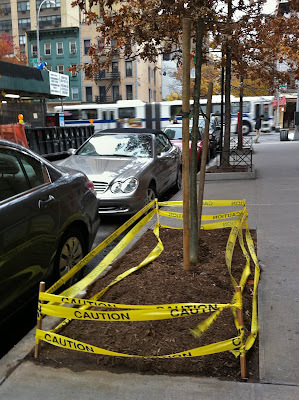 The next morning we had warning tape in place and I planted spring bulbs provided by the Block Association. The tape will remain until new curbs and fence are installed. The new tree pit is almost twice as long as the original, adding a good 12 sq. feet of growing space for the tree roots. I'm told that the city plans to enlarge all tree wells as trees need replacing. 1.In each of two summers without the tree, summer annuals for shade like coleus and caladium grew 3-4 inches higher than the same species under the trees. (above), annuals under a pin oak. (below), no tree. 2. One youngish woman in my building asked me, the garden lady, what was new in the garden. She told me she never noticed the dead tree or that the tree was sawed off or that the tree had been replaced. Over two years of not noticing a site she walks by directly in front of her building. And I thought it was so important! What a great idea. Great photos too! Work in progress...love it!